The Reach Cambridge scholarship essay competition is designed for academically excellent high school students aged between 15 and 17 who would otherwise not be able to attend our summer programs. Please note that this scholarship competition is not for application to the University of Cambridge. Please note, the Scholarship Scheme for 2018 is now closed. Successful applicants will be contacted on or after the 31st December 2017. 3 week scholarship prize (awarded to a maximum of 2 students): 100% of the program fee for our 3 week Program 1 in 2018. 2 week scholarship prize (awarded to a maximum of 3 students): 100% of the program fee for either our two week Program 2 or our two week Program 3 in 2018. Please note that both prizes include all those items ordinarily covered by the program fee. They do not include the cost of flights, or other items which are not ordinarily covered by the program fee. We may also award a prize for our Spring Program which will be decided at the discretion of the Scholarship Team. See terms & conditions for further details. To craft a good essay requires careful argumentation, clear structure and personality. It is these characteristics that we will look for in judging applicants’ essays. We will also take into account the letter of recommendation supplied by your school. Copy your essay into the box provided (it should be no longer than 1000 words). Answer all other questions on the page. A letter of recommendation from a member of staff at your school must be uploaded using the form in the Scholarship Tab of your account page. This should be written on official headed school paper, and should outline why you are a good candidate for the scholarship: it should tell us what makes you academically excellent, and it must give us some indication of your financial circumstances. For example, if you attend a fee-paying school, the letter must specify whether you attend the school on a scholarship, or whether you are full or part fee-paying. It must include contact details for the member of staff so that we can contact them for further information if necessary. This is the only part of the application that should come from your school – the rest needs to be completed by you. You must also complete the School Transcript, Declaration Form, Parent Info, and School Info sections of your account. Please note that if you do not complete all these sections of your application, we will not consider your application. They should all be “ticked” on your account page before the deadline. Shortlisted candidates will be notified by 31st December 2017, and will be invited for an online interview. Applicants must be between the ages of 15 and 17 on 1st July 2018, and currently studying at high school. The students must complete the essays independently – they must be original non-plagiarised work. The closing date for scholarship applications is 1stof December 2017 at 23:00 GMT. We will only consider full applications submitted by this date. A full application is one that includes an answer to the essay question and all other questions on the “Scholarship” tab, the letter of recommendation from your school, and also has the following sections completed on the account page: School Transcript, Declaration Form, Parent Info, School Info. Applicants from fee-paying schools will only be considered if their letter of recommendation confirms that they attend the school on a scholarship. The prizes provide without charge all those items ordinarily covered by the program fee, including accommodation, all excursions, lectures, theatre trips, workshops and tuition, and half board meals. These prizes do not include those items which are not ordinarily covered by the program fee: flights; transportation to/from Cambridge at the start and end of the program if travel is undertaken independently; third meal of the day (half board is provided); optional enhancements shown to have an extra fee; snacks, drinks and meals purchased away from the program; pocket money and souvenirs; visa costs (if required); books for credit courses and classes; laundry (aside from bed linen); travel insurance, medical insurance and any medical or dental fees. It is not guaranteed that Reach Cambridge will offer scholarship prizes to any of the candidates. Reach Cambridge reserves the right to not award scholarship prizes. Shortlisted candidates will be notified by 31st December 2017. Shortlisted candidates will be invited for an online interview in early January 2018, and will be notified of the outcome by the end of January. The author of the students’ recommendation letter may be contacted for further information. By submitting an application to the scholarship competition, the student agrees to assist with promoting the scholarship scheme if awarded a prize. The successful applicant also agrees to their name being published on the Reach Cambridge website, as well as on its social media pages. The student must have permission from a parent or guardian to accept the scholarship. Scholarship prizes are conditional on parental approval – a parent/guardian will be required to sign a declaration that they accept the Reach Cambridge terms and conditions and rules and regulations. Students do not have to pay a deposit before applying for the scholarship. 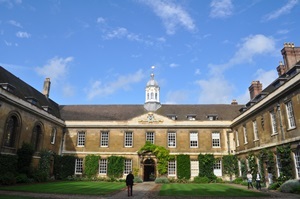 Please note that all terms and conditions for Reach Cambridge courses, including the cancellation policy, also apply for scholarship applicants.